NAMM 2017: This looks set to be a big year for Taylor, as the American acoustic guitar giant joins the mid-range guitar market with the Academy Series, while also unveiling the GS Mini Bass and high-end 800 Deluxe Series. 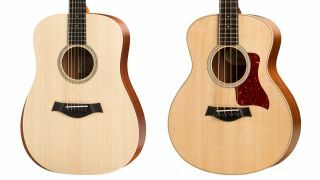 The Academy Series aims to capture the essence of Taylor guitars in affordable packages - models include the Dreadnought A10e (£659/$798), Grand Concert A12e (£659/$798) and nylon-string Grand Concert A12e-N (£707/$858). Each guitar is well-spec'd, too, with layered sapele back and sides, a solid Sitka Spruce top, the patented Taylor Neck, mahogany armrest, matte finish, plus ES-B electronics and a Taylor gigbag. Academy Series models are available from March. The small-scale GS Mini Bass is notable for two key design features: custom bass strings with a nylon core and phosphor-bronze wrap wire developed by D'Addario; and a new Taylor-patented, dual-pronged bridge pin. All that promises to make the bass easy to play, while an ES-B pickup and preamp, as well as layered sapele back and sides, solid Sitka spruce top, matt finish and hard bag round off the spec. The GS Mini Bass is available from March for £827/$918. Expanding on the 800 Series, the 800 Deluxe Series adds three premium upgrades: a new, rounded radius armrest to improve playing comfort; Adirondack spruce bracing, which enhances tonal output; and chrome Gotoh 510 tuners for finer tuning precision. Three Deluxe models have been introduced, and are available now: the Dreadnought 810e DLX, the Grand Concert 812ce 12-Fret DLX, and the Grand Auditorium 814ce DLX. For more information on all of the guitars, check out Taylor Guitars.